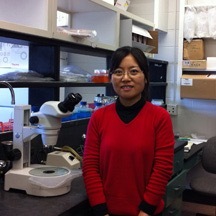 Xiaobo Wang, a first year PhD student from the Cellular Molecular and Microbial Biology Program in the laboratory of Dr. Ekaterina Voronina received a CBSD summer fellowship award for 2016. Wang, an international student from China, focuses on how LC8 Dynein Light Chain promotes localization and function of stem cell RNA regulator FBF-2 in C. elegans. This fellowship provides a stipend to departments and graduate programs to subsidize existing teaching assistant positions. CBSD awarded a total of 7 fellowships for current graduate students in 2016.